September's Mixer at Vantage West Credit Union in Marana was the perfect setting to start the conversation about banking with a local credit union or bank. 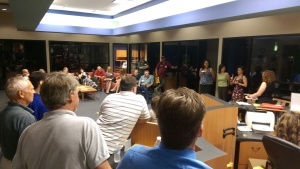 The beautiful Marana branch office was a great space to hold our mixer. Adding to the wonderful atmosphere, Mama's Hawaiian Bar-B-Cue catered the event and filled the room with the delicious smell of BBQ and filled the stomachs of everyone there. The Marana branch is one of Vantage West’s newer buildings, and is a flagship example for their other locations. Our hosts at Vantage West helped us kick off our September Switch month. During September, we are promoting and educating the public and business owners about the advantages and benefits of banking with a local bank or credit union. Arizona has 95% of it's money in three major national banks. Local banks and credit unions are more likely to give a small business loan, and give a better rate than the large national banks, because they have knowledge and expertise about working with clients in our own city. Like other local businesses, local banks and credit unions have a vested interest in seeing local businesses succeed. Our friends at Vantage West are helping us put on a Member Seminar on Banking Basics, Wednesday September 30th from 9-10 am, at CoLab Workspace, Downtown. James Barron of Vantage West Credit Union will be discussing the 7 Mistakes not to Make- The Local Banking Basics that Keep you in Business. Barron is an AVP and Senior Relationship Manager and was recently named “Peter Barent Vosburgh Individual Lender of the Year. Be sure to RSVP here before the event. Don’t miss this great seminar! Wist Office Products is an amazing Local First Arizona partner, offering 10% off and free shipping to LFA members. Wist also contributes a portion of LFA member sales to a rebate program driving donations to local non-profits. At the mixer, they donated part of those funds to Heirloom Farmers Markets, an organization doing great work making fresh healthy produce available to lower income families and members of this community. Like to learn more about buying your office supply needs from Wist? Contact Tucson representative, Jeanette Dempsey at [email protected]. Make sure to let them know you are an LFA member and a portion of your office supply purchases will go to help local nonprofits. Looking for a good gift idea? Look no further! Local First Arizona and the Downtown Tucson Partnership have just released the Downtown Tucson Gift Card. This one stop shopping pass to local business will be your favorite gift to give and get. The card will be good at over 70 downtown merchants. Get yours here! Need to renew your membership? Renew online here and don’t forget to sign up for our newsletters. These are a great way to stay on top of great local happenings and important local business “news you can use”. Or if you're a current member looking to maximize your membership and to get more involved with LFA, register for our next Membership 101 Seminar HERE. Our next mixer will be hosted by Borderlands Brewing Co. on October 7th. Hope to see you then! Please make sure to RSVP here.